If you haven’t invested in proper lighting solutions for your pool then you are missing out on some seriously fun stuff. Behold, night-swimming is a hobby fit for the working professional, the student, or anyone in between. What’s the difference between swimming during the day and swimming at night? Well, the ambiance is the main difference. During the day we are often greeted with the sounds and sights of lively animals and friends. At night we have bats, silence, and the relaxing chirps of crickets to keep us company. The temperature tends to be a bit cooler and the whole world is a lot quieter. Taking a swim at night can be a surprisingly meditative. As you can imagine, there are some things that you should watch out for as you swim at night. Dangers can pose an issue. At night we simply cannot see as well as we can during the day. 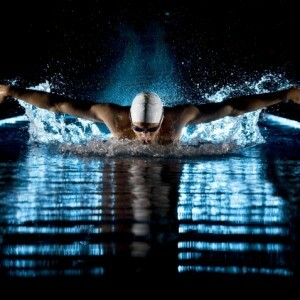 So, when we swim at night, we cannot see things like a puddle or an obstacle as we walk or run around our pool. This makes cleaning up at the end of the day absolutely essential in the event that someone in the family wants to go night-swimming. A stray pool noodle is not a huge deal during the day, but with limited visibility, it can become a serious hazard at night. Nighttime also stops you from seeing any animals that might be lurking about such a snakes or foxes. At night we simply can’t see as well as we can during the day and what we can’t see can hurt us. It is for these reasons that we strongly advise people to invest in the proper lighting solutions for their pools. After all, safety is essential. But don’t forget the fun. The fun of experiencing new things can often outweigh our fears of the unknown. So, make sure you have the right lights and then jump right into a night of swimming and experience a calm like none other. Call Aqua-Bright to consult an outdoor lighting specialist about pool lighitng. Call Aqua-Bright today at 410-489-9009 or take a tour through our website. This entry was posted on Thursday, March 26th, 2015	at 2:07 pm	. You can follow any responses to this entry through the RSS 2.0	feed. Both comments and pings are currently closed.